U.S. Supreme Court. CLAY, aka ALI v. UNITED STATES. Washington, D.C.: GPO, 1971. In 1966, Muhammad Ali (formerly Cassius Clay) was classified as 1-A (eligible for service in the U.S. armed forces), two years after being classified as I-Y (not qualified), due to an amendment in his mental aptitude test. In response, Ali applied for conscientious objector status but was turned down by both his local draft board and the State Appeal Board. According to existing statutes, the matter was then referred to the Justice Department for an advisory recommendation and the FBI, in preparation for a hearing on "the character and good faith of the [petitioner's] objections," conducted more than 35 interviews with Ali's family, friends, neighbors, and business and religious associates. The hearing officer at Ali's hearing, after listening the testimony of Ali's parents, one of his attorneys and Ali himself (and after reviewing the report generated by the FBI to which he had access), recommended to the Justice Department that Ali be granted his conscientious objector status. 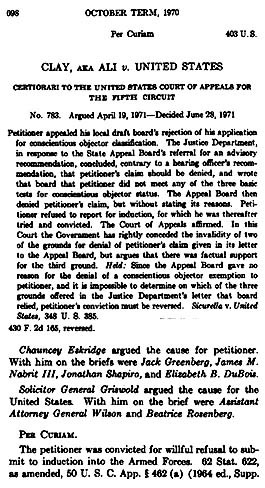 "That denial, for which no reasons were ever given, was, as we have said, based on a recommendation of the Department of Justice, overruling its hearing officer and advising the Appeal Board that it 'finds that the registrant's conscientious-objector claim is not sustained and recommends to your Board that he be not [so] classified.' This finding was contained in a long letter of explanation, from which it is evident that Selective Service officials were led to believe that the Department had found that the petitioner had failed to satisfy each of the three basic tests for qualification as a conscientious objector." "Since the Appeal Board gave no reasons for its denial of the petitioner's claim, there is absolutely no way of knowing upon which of the three grounds offered in the Department's letter it relied. Yet the Government now acknowledges that two of those grounds were not valid. And the Government's concession aside, it is indisputably clear, for the reasons stated, that the Department was simply wrong as a matter of law in advising that the petitioner's beliefs were not religiously based and were not sincerely held." Therefore the Supreme Court Justices decided (8-0 with Thurgood Marhall abstaining) in favor of Muhammad Ali.